A passing glance beyond most Charleston garden gates presents a glorious slice of verdant, timeless grandeur. And it’s not only the hallmark camellias and fig vines that delight; it is often some pièce de résistance—an inviting cast-iron seat, a stately urn, an antique sundial. And it may well be a treasure plucked from a scouting expedition by Patrick Bradley, a historic preservation enthusiast, or his partner, landscape architect Glen Gardner. Since establishing Charleston GardenWorks in 2014, the two have been searching far and wide to cull those rare and rarified pieces that were created to inspire—and built to weather the elements. A pop-up shop at the Preservation Society yielded results impressive enough that they started online sales, expanding in 2015 to showrooms at Fritz Porter and AIM on King. “I look for intriguing objects that are well made,” says Bradley, whose finds are often priced in the thousands. Can’t invest yourself? Peek politely through enough garden gates, and you’ll likely enjoy glimpses, at least, of some of their storied pieces. 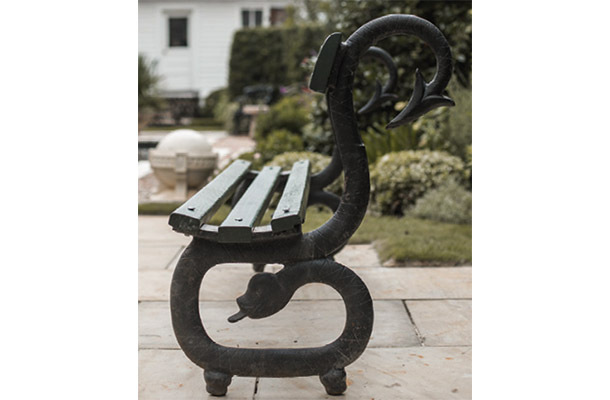 Have a Seat: “Aside from being a decorative element, benches serve as a suggestion: ’Come have a seat in the garden,’” Bradley says. Timing Matters: Form and function meet in an antique bronze sundial. A signature of iconic Charleston gardens like the one at Middleton Place, it provides timely, yet timeless, allure.